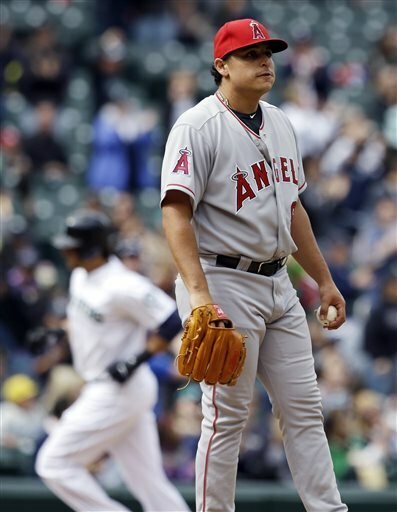 The Mariners played the Anaheim Angels this last weekend. Yes, Anaheim. Los Angeles Angels of Anaheim is just stupid and they play in Anaheim. The Mariners took 3 of 4 in the series and actually won the series! Next, they'll be winning the World Ser.....never mind. They also beat Baltimore on Monday, but I'm going to stick with the Angels series. The Angels series saw the Mariners hitters actually hit the white spherical object in fair territory and score runs. Not only that, they hit home runs. At home. Strange, I know, but they did it and showed those Angels who the better team is currently. The Mariners are slowly crawling their way back to respectability and, after the win Monday, hold a record of 12-16. Not exactly noteworthy, but seeing where this team was headed earlier in April, it allows fans to breathe a little. I'm going to try something a little different. Not completely different, but a little. I may continue it and I may not, but for now at least, the numbers for the series against the Angels. The games weren't entirely exciting, save for this home run by Mike Morse. That was in the last game of the series in the bottom of the 8th to put the Mariners ahead 2-1. Against Jason Vargas. The irony, of course, is that Vargas gave up a bunch of home runs last season and the 2 runs scored in that game came from Morse's solo shot and another solo homer by Jason Bay the inning prior. Oh irony, I love thee so. One thing I still don't understand is Wedge yanking Felix Hernandez after 95 pitches and 8 innings of work on Saturday. I'll touch on the start later, but Joe Saunders was at 93 through 8 and went back out to finish off the game. The only difference, really, is that Saturday was a save situation. I get that Tom Wilhelmsen is one hell of a closer, but 95 pitches for your ace at the end of April? I assume they're holding him back a little for later in the season, but the guy is an ace. He can finish out his own games. Otherwise, why are you paying him $175 million for? I'd certainly hope that it's not to baby his arm. Yes, I said baby his arm. Felix is a big dude who is used to throwing a lot of pitches for a lot of innings. While he may get injured at some point, all pitchers do. Holding a guy back on April 27th isn't going to keep him from getting hurt on September 27th or 5 years down the line. Treating Felix like a rookie who needs protecting when he's your ace is counterproductive. If you're going to treat a guy like a rookie who needs protecting, Franklin Gutierrez is on the DL. See what you can do about him. Actually, I can use him as an example. They were easing him in to games rather than him playing every game every day and he still got hurt. There's nothing scientific about how you use a pitcher. Every player is different and the only predictive property to injuries is a past injury. I may be in the minority on this, but Felix has done this before. Let him do what he's done in years prior instead of changing it up mid-stream. The pitching in this series was stellar, obviously, especially the bullpen. Not so stellar was Aaron Harang, who gave up 5 of the 6 runs in Friday's 6-3 loss. That's yet another move I just don't understand. Finding a veteran starter and moving Blake Beavan to the bullpen after two starts was a snap judgement and not a very good one. Two starts in April tells you nothing compared to a player's track record. Granted, we all know what Blake Beavan is as a pitcher and while it's nothing to get excited about, its still better than an aging veteran who is on the down slope of his career. Probably not a popular choice, but I'd like to see Hector Noesi give it another go in the rotation. Granted, the difference between the bullpen and the rotation is massive, but he can't be too much worse than Harang and if he is, you can put him back in the pen or send him down and plug Beavan in the rotation. He'll get the job done at least. Noesi has appeared in 3 games and has an ERA of 1.23 in 7 1/3 innings. He went 3 1/3 in relief of Harang and gave up just the one run on two hits, two walks and three punch outs. I say give the kid a chance. It's not like our expectations can get any lower for him, so he'll either meet expectations or surprise the hell out of everybody and do a decent job. Basically, this series epitomized the current Mariners roster. The starters held down the offense, save for Harang, the relievers slammed the door hard enough to break the Angels' collective nose and the hitters hit except when there were runners in scoring position. They didn't strike out quite as much as they have so far, but it's still a problem. Having Justin Smoak batting fifth hurts my eyes when I watch, but what other option is there? Jesus Montero could probably do the job just as well, if not better, but other than that there's nobody. The offense is extremely top-heavy, with just enough momentum to get close to the peak and then roll back down when it reaches the number five hitter. After that, its a roll of the dice as to whether or not they'll do anything. That being said, the offense did an okay job of getting it done when they needed to despite their best efforts to squander every chance they had. If they can figure out how to hit with runners in scoring position, they might actually have something here. Not a playoff contender, certainly, but maybe a team that can break .500 for the first time in a decade. Slight exaggeration there, but it sure feels like it sometimes. With any luck, this series got the bats a little more warmed up for the coming months and they'll start scoring some runs. If not, we'll have these few days in April when the Mariners were in third place looking down at the fourth place Angels, laughing to themselves as they thought they were on their way to playing with the big kids.